After surgery to remove your bladder, you might have a small hole called a stoma on your tummy (abdomen). Your urine now comes out through the stoma. You will need to learn how to look after it before you leave the hospital. Your stoma nurse can show you how to do it. Stoma nurses are experienced in looking after stomas and teaching you how to do this yourself. You might see your stoma nurse before the operation. They will show you the different types of urostomy bags you can use and they might give you a stoma kit to practice on first. After your operation, your stoma nurse might change your urostomy bags. This is until you can change them yourself. They can also explain to you how to put thin tubes into the urostomy to drain out the urine (self- catheterisation), if you need to do this. Before you leave the hospital, your stoma nurse will give you some urostomy bags to take home. They might also set up an ordering system for you to get the bags from your local pharmacy. Or they may give you a prescription card to take it to your GP with the details of all the equipment you need. After you leave the hospital, your stoma nurse might visit you at home to make sure that you are coping. Or you may have a district nurse visit instead. Do feel free to ask for their help with any questions or difficulties you have. There are 2 main types of urostomy bags. A 1 piece system and a 2 piece system. Your stoma nurse will help you to find out which system is best for you. The bags are very flat and do not smell or rustle as you move around. Under ordinary clothes no one can tell you are wearing one. The bag can stay in place for a few days at a time. It has a tap at the bottom so you can empty it into the toilet. The 1 piece system has the bag, seal and adhesive patch. It can last for 2 or 3 days. The 2 piece system has a separate bag and adhesive wafer (flange). The wafer is a soft, flat, plastic adhesive disc that sticks to the body. The bag clips onto the wafer. You can leave the wafer in place for up to 5 days and just change the bag. To fit a new bag, at first you need to cut a hole in the wafer or adhesive patch to fit your stoma. 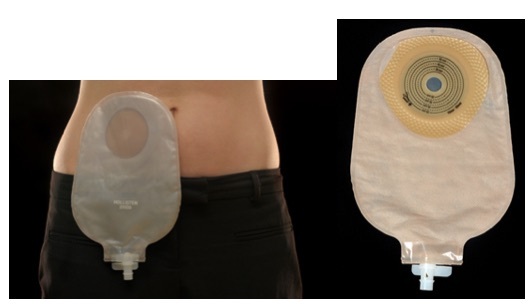 When your stoma has settled in size, you can get bags that are pre-cut to fit. The more accurate the fit, the less likely the bag is to leak. You get very good at this with practice. It’s helpful to keep everything that you need in a bag or in one place. That way, you won’t be halfway through and realise something important is missing. Your stoma nurse will show you how to change your bag. They make sure you know how to do it before you leave the hospital. Since bacteria grow quickly in urine, it’s important to empty the pouch often, at regular times. Changing your bag can be difficult at first. With practice you start to learn what you need and what works best for you. It can also help if your partner or someone else close to you understands how to manage a urostomy.